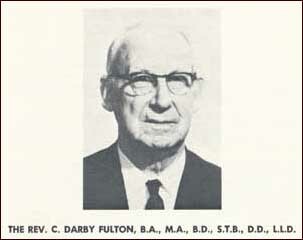 As the newly formed denomination met that December in 1973, there was much to do and little time in which to accomplish it. The opening of the General Assembly had begun on the previous day, December 4th, at 7:30 PM with a time of worship and an opening address delivered by ruling elder W. Jack Williamson. That address was titled “To God Be the Glory”. It was in the afternoon session of this second day of meeting that the new denomination selected their name, choosing “National Presbyterian Church.” (A year later, that name would be changed to “Presbyterian Church in America.”) The rest of that afternoon was spent in discussion and adoption of constitutional documents [the Westminster Standards and the Book of Church Order]. After dinner, the Assembly met yet again for worship, with the service under the direction of the Rev. Kennedy Smartt, then pastor of the Presbyterian church in Hopewell, Virginia. The Rev. Tim Fortner, of Hazlehurst, Mississippi, led in prayer. The Rev. Sidney Anderson of Swannanoa, North Carolina, read the Scripture, and Dr. O. Palmer Robertson, professor at Westminster Theological Seminary, preached a sermon entitled “The National Presbyterian Church and the Faith Once Delivered,” taking Jude 3 as his text. After the time of worship and before recessing for the evening, the Assembly continued its work on constitutional documents by adopting the first ten chapters of the Book of Church Order. The Assembly then recessed with prayer by the Rev. Todd Allen, pastor of the Eastern Heights Presbyterian church of Savannah, Georgia. That second day of business was full and busy for the Assembly, but note how not just once but twice they met for times of worship during the day. I am reminded of Martin Luther’s statement, “I have so much to do today that I must spend the first three hours in prayer.” There is more truth in that statement than most of us are willing to admit, and certainly more than most of us are willing to live up to. But that first General Assembly of the PCA recognized their priorities and their need to completely and utterly rely upon the Lord in all their deliberations. If you haven’t been living according to this pattern, then I urge you, test the Lord—try Him and see—put Him first each morning with a time of prayer and devotional Scripture reading. It doesn’t have to be long, perhaps just five or ten minutes if you can’t spare a half-hour. But I have every confidence that you will begin to see a marked improvement, first in your relationship with the Lord, and then in your relationships with family, friends, and work.